Iranian students turned out on Tuesday, December 4th in a strong gesture of solidarity with their jailed peers and teachers, as well as the striking steelworkers and sugar cane workers that have mounted protests of their own in recent weeks. The protests came just days before Iran’s annual Student Day, which also marks the anniversary of the 1953 murder of three students at the hands of the Shah’s violent police force. 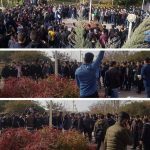 Students gathered at Tehran’s Amirkabir University of Technology turnout in force, chanting powerful slogans and forming a human chain as a visual representation of the shackles repressing the Iranian workforce and a gesture of unity with their jailed students and teachers. The students changed anti-regime slogans like, “victory is near! Down with this deceptive government”. The student protest explicitly called for the release of jailed Iranian students and teachers. Mohammad Habibi was a teacher recently completed a 10-year sentence for his educational activist activities, however, he has not been released from prison. The students are also calling for the immediate release of two workers recently arrested during the protests undertaken by the workers of the Haft Tappeh sugarcane factory. Esmail Bakhshi and Ali Nejati were both detained by regime authorities during the recent strikes. The People’s Mojahedin Organisation of Iran (MEK) reported that Bakhshi was reportedly tortured whilst in regime custody, suffering injuries so extensive, he needed hospital treatment. The student protest stoked regime fears that dissent and civil unrest could spread, leading to further anti-regime demonstrations across Iran similar to those seen in December and January. In an attempt to prevent the protest from spreading, the regime sent plainclothes agents to deal with the protestors. Among videos circulating online of the protests is one where the regime’s agents appear to resort to violent strategies to contain the protest, clearly injuring one protestor at the scene. The regime’s fears were justified. The protests have already spread among Iran’s youth and other universities and student bodies have joined the movement. 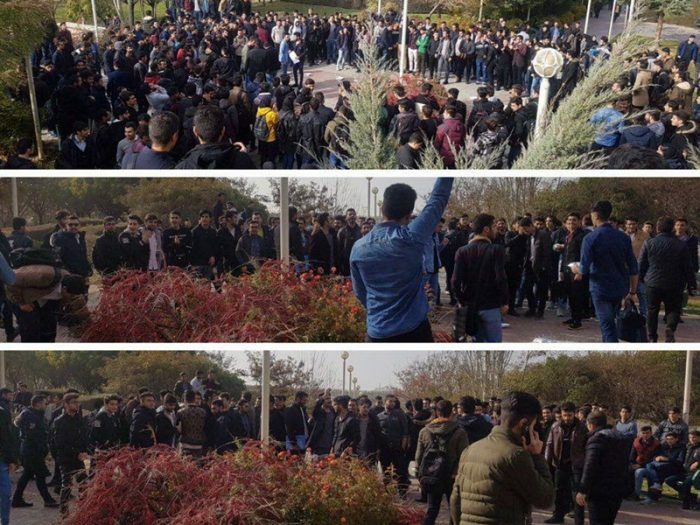 In Northern Iran, students at Nowshirvani University turned out to protest government incompetence, regime oppression, and poor living conditions. They held anti-regime signs reading, “stop the crackdown against students”, and “students will not live in shame”. Students of the Nowshirvani University holding a gathering on the brink of Students Day marked on Friday, December 7. In Tabriz, students also protested. There were also reports of students protesting in Ahvaz, the site of the recent steelworkers’ protests. The students joined the brave workers of the National Steel Group in a display of support in their crusade against unpaid wages, corrupt management and the arrest of their own fellow workers. The student movement and the workers’ movements have many parallels. Both are facing regime suppression and corruption. Both have colleagues sitting behind bars due to arbitrary arrests, and both want to see regime change usher in a new dawn for Iran. President-elect of the Iranian opposition, Maryam Rajavi, has lent her support for both movements and called on the international community to lend assistance and support wherever they can to Iran’s protesting students and workers.